New research from Roy Morgan shows 59 per cent of Australians intend to visit a domestic holiday destination and stay at least one night on their next trip. But where are all these Aussies heading on? Melbourne has once again emerged as leading holiday destination for Australians with over 1.5 million Australians intending to stay for at least one night in the Victorian capital on their next trip. In a clear second place is Australia’s largest city of Sydney with over 880,000 Australians intend to stay in Sydney for at least one night on their next trip. Queensland capital Brisbane rounds out the top three with over 570,000 Australians intending to visit. Other popular holiday destinations for Australians include the Great Ocean Road including Torquay, Lorne, Port Fairy etc. (522,000), the North Coast NSW including Forster, Port Macquarie, Coffs Harbour, Port Stephens etc. (521,000) and the Hunter Valley, Newcastle, Lake Macquarie, Gloucester region just north of Sydney (437,000). Australia’s smaller Capital Cities including Canberra (388,000), Perth (348,000), Adelaide (339,000) and Hobart (313,000) rank between 8th to 14th overall as destinations Australians intend to stay for at least one night on their next trip. Are Australian holiday intentions driven by psychographic factors? According to Roy Morgan, Helix Personas is a unique and powerful consumer segmentation and data integration tool that combines sophisticated psychographic and behavioural data to classify the Australian population into 54 Personas and six Communities. Helix Personas uses a combination of Roy Morgan Single Source data and third party data sources. This information is used to understand future buying intentions and media consumption patterns. These are easily integrated with third-party datasets. Analysing the holiday intentions of Australians by their Helix Persona Communities, and the underlying Helix Personas, reveals different travel destinations around Australia are more attractive to certain types of Australians than others. 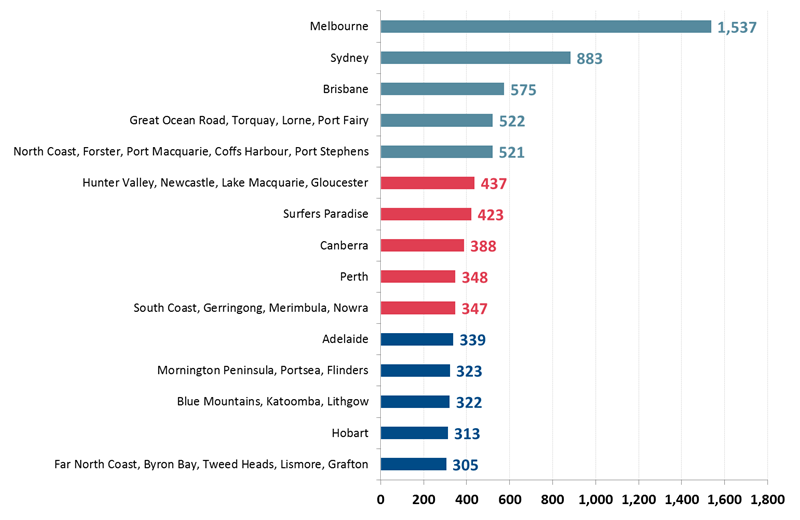 A closer look at Australia’s ten leading holiday destinations shows 300 Aspirationals more likely to choose Melbourne than other Helix Personas Communities whereas Australians in the 400 Hearth & Home Community are more likely than other communities to choose Sydney, Brisbane and Perth. The Great Ocean Road and Surfers Paradise are more likely to attract 200 Metrotechs than other Helix Personas Communities while 100 Leading Lifestyles are the Helix Personas Community most likely to plan a trip to the North Coast NSW, Canberra and South Coast NSW. Source: Roy Morgan Single Source, October 2017 – September 2018 (n = 15,009). Base: Australians 14+. *Great Ocean Road includes Torquay, Lorne, Port Fairy, North Coast NSW includes Forster, Port Macquarie, Coffs Harbour, Taree, Port Stephens, Hunter Valley, Newcastle includes Lake Macquarie, Gloucester, South Coast NSW includes Gerringong, Merimbula, Nowra. But the obvious question is – what type of Australians do these Helix Personas Communities and, drilling down further, these Helix Personas represent? 300 Aspirationals: Ambitious, up-and-coming, culturally diverse young families, young singles and couples committed to creating a successful future. 307 Experience Seekers include a high proportion of young people – teenagers still living at home with their parents and young adults taking their first steps to independence by living out of home. They are culturally diverse, just under half were born in Australia. Most of those born overseas hail from India and other parts of Asia (excluding China). 400 Hearth and Home: Highly educated, socially aware, hard-working, ambitious and culturally diverse young singles typically renting apartments in the inner city and inner suburbs. 407 House Proud are focused on home and are perennial home improvers. You’ll find a mix of ages and household types among them, living in metro and country areas of NSW and Queensland. 200 Metrotechs: Highly educated, socially aware, hard-working, ambitious and culturally diverse young singles typically renting apartments in the inner city and inner suburbs. 206 Fit and Fab are Fad loving and tech-oriented. Fit and Fab are amongst the youngest of the Metrotechs. One in 3 are aged 14-24, and close to half are currently students and either living in shared households in inner city Sydney and Melbourne or with their parents. Thousands of people have ranked Sydney the worst city in the world. In other news, water is wet. Think people don’t use agents for domestic travel? WRONG! We caught up with Hans Belle to find out how agents can make the most of long weekends by pushing domestic adventures.